It's an argument which has raged since primitive man first learned to bang a drum and plug in an electric guitar: which city in the UK has the best music scene of them all? Well, a recent survey conducted by, erm, Leonardo Hotels, who are no doubt experts in the field, takes us one step closer to settling the argument for good. 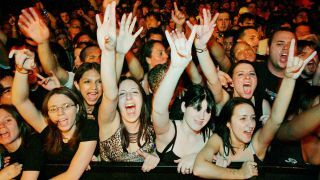 They got together to analyse data from 50 of the biggest cities and towns across the UK and Ireland to work out where the best place to be a music fan is in the UK. They ranked the cities on three key criteria: the number of venues in the city, the number of monthly gigs in the city and – most importantly – the average cost of a pint of beer in said city (which, incidentally, we suspect was a ploy to stop London coming first. It's a fair cop, guv'nor; anywhere with venues that charge £7 for a pint should really forfeit its place in this list). Those stats were adjusted according to population in order to provide an overall ‘music fan ranking score’ for each location. Spoiler alert: London did actually come first, because of course it did. Manchester came in second, with dark horse Brighton and Hove sneaking into third. You can find the full results below. They might just blow your mind.